Two brothers move to a coast town in California. The older one is seduced into joining a teenage vampire gang and its up to his younger brother and his ‘vampire hunter’ friends to save him. I’m disappointed. This has been said to have been one of the best vampire films…a cult classic…I expected it to be explosive…totally wicked…But nope…I didn’t find it great. Ok maybe you have to be there in the 80’s to actually fully appreciate this movie. Sorry but I cannot get past the bad make up…the weak special effects…and the frog brothers…just don’t like the comedy there. 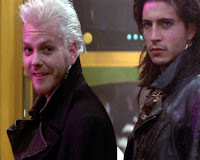 The only wicked thing in this film was Kiefer Sutherland as David, the head of the Lost Boys. I mean he was rebellious, rude, dangerous, rode a motorcycle…he was the ultimate bad boy. On the whole yes…it was entertaining and I say if you like 80’s flick you’d might want to check this one out.